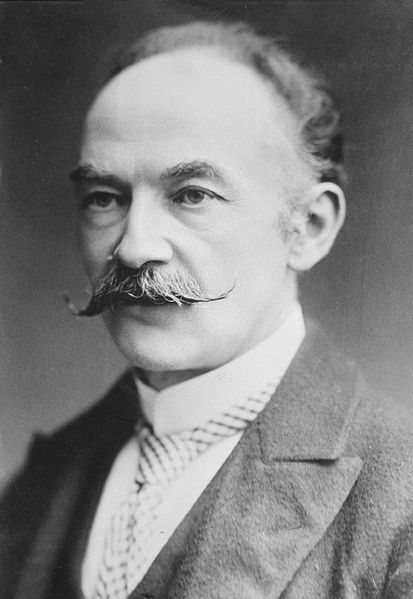 A Victorian poet and novelist, Thomas Hardy followed the realist tradition of George Eliot and romanticism, particularly William Wordsworth. Hardy was inspired by Charles Dickens, likewise highly critical of Victorian society, though Hardy focused more on the decline of rural life. He is most famous for Tess of the D'Uerbervilles (1891), and Far from the Madding Crowd (1874), though he considered himself primarily a poet. His poetic work was rediscovered and inspired the Movement poets in the 1950's and 60's. Born in Bockhampton, England in 1840, his family couldn't afford a university education, so he ended his formal studies at 16, apprenticed as an architect, later moving to London to oversee a church graveyard excavation project. He didn't care for London, bothered by poor health, class divisions and feeling socially inferior. He became interested in social reform, particularly the works of John Stuart Mill. He moved back to rural Dorset, where he began his writing career. Most of his stories are set in rural southwestern England involving tragic characters struggling against social circumstances. You may enjoy reading D.H. Lawrence's reference to Hardy in his book, Studies in Classic American Literature.